If you’re new to home remodeling or historic preservation, or just new to Hudson Valley Preservation, you might find the following information helpful. Hudson Valley Preservation has been honored by its clients and peers – receiving multiple top awards in the design and build field. See some of them here. The design and build concept has its origins in the “Master Builder” approach, where a single person or company holds total project accountability- from start to finish. Hudson Valley Preservation’s method of home remodeling offers the homeowner single- source, integrated building solutions under one roof. It is a bottom up process that mutually supports the client, designer and construction team members in realizing the client’s dream. HVP’s innovative 24-hour, web-based communications system provides on-demand access to a project from start to finish. For more about the design and build process. What geographic area do you work in? Hudson Valley Preservation has construction licenses in Connecticut and the Hudson Valley region of New York. Our historic preservation consulting services are applicable anywhere. What is historic preservation, and why is it important? Historic preservation encompasses buildings, landscapes, and objects. It is the practice of protecting and celebrating places that tell the stories of our past, which helps to ensure that each town, city, and natural habitat retains its unique character. This is vital to understanding our cultural heritage, and ultimately translates into vibrant places to live and visit. It is a fact that towns and cities with strong historic preservation practices enjoy significantly better local economies and quality of life, and it all starts with s shared vision. What is the difference between preservation, restoration, reconstruction, rehabilitation, and renovation? Preservation focuses on the maintenance and repair of existing historic materials and retention of a property’s form as it has evolved over time. Reconstruction re-creates vanished or non-surviving portions of a property for interpretive purposes. Rehabilitation acknowledges the need to alter of add to a historic property to meet continuing or changing uses while retaining the property’s historic character. Renovation is similar, but may not necessarily take into account maintaining historic integrity. Can I use my own trade contractor? Our strength is our team. If a client were to bring someone new onto the team—he/she would be weakening the team regardless of the strength of the new member. It’s the difference between running a professional basketball team versus an untested pick-up team. HVP takes full accountability for each project’s success and stands behind its work 300%-even after a job is done. A proven, consistent team is a must-have for delivering client satisfaction. It’s why we give a two-year warranty on every project we do. Learn more about our team of design/build professionals. What is a historic building? A historic building is technically defined by those in the preservation field as being greater than 50 years old. It does not have to be historically significant for any reason other than its age. It can be simple or ornate, stylized or vernacular. Historic buildings which have maintained architectural integrity, have historic significance as being associated with notable people or events, or which have archeological importance, are very often eligible for inclusions on the National Register of Historic Places. Obtaining this designation is done so through a thorough application process that is often coordinated by a historic preservation consultant in cooperation with the State Historic Preservation Office. Having a building included on the National Register of Historic Places does not place limitations on what the building owner can or cannot do; it is primarily an honor. For historic preservation and rehabilitation projects, why choose HVP? Depending on the complexity and nature of your project, there may be several steps involved to achieving your vision…feasibility studies, conditions assessments, grant applications, seeking rehabilitation tax credits…as well as physical design and construction work. With HVP, we offer all of these services in-house, so you only have to communicate with one individual company. For projects that require additional specialties such as engineering, we involve one of our trusted colleagues to collaborate. This ensures a simplified experience for you, and greater predictability for us. "Green" living is important to me. How can I achieve this with my old building? Historic preservation is inherently green, because it focuses on utilizing the building that already exists, rather than demolishing and reconstructing it. When a structure is torn down, all of the energy that went into constructing it, from materials production to physical labor and fuel, is wasted. Additionally, many historic components are composed of sustainable materials like wood and glass and can be routinely maintained, rather than elements such as vinyl windows which need to be replaced frequently and ultimately end up in landfills. By practicing cyclical maintenance and integrating modern heating, cooling, and insulation systems, your building can be energy efficient without compromising its historic character. My preservation organization's historic property may be in need of repairs and/or maintenance. How can HVP help us determine what our historic property's needs are, what we need to do to address them, and how much this will cost? HVP’s X-Ray process involves a thorough investigation, or conditions assessment, of a building’s structure and overall conditions. The resulting report will provide your organization with a detailed analysis of the state of your structure, required and suggested repairs, and estimated costs for such repairs. This report can then serve as your organization’s planning guide for managing repairs and maintenance. Did you know that non-profits and municipalities can be eligible for grants to offset the cost of obtaining a conditions assessment? HVP’s preservation consulting team can assist your organization with the upfront grant process prior to conducting the conditions assessment X-Ray. What grants are available to non-profits and municipalities to offset costs for historic restoration or rehabilitation? There are many different grant options available for non-profit or municipal preservation organizations, both for restoration planning and actual bricks and mortar work. The options ultimately depend on what your organization’s needs are, and which grantors best meet these needs. HVP’s team can help you navigate the options, and assist you with the grant application process. Don’t have a grant writer on staff? HVP can even write and submit the grant application on your organization’s behalf. What is the National Register of Historic Places, and does listing on it place limitations on what I can do with my building? The National Register of Historic Places (or “NR”) is overseen by the National Park Service within the Department of the Interior. A building that is awarded this designation is recognized as historically significant, according to criteria established by the Park Service. The application process for NR designation requires a working knowledge of historic preservation and architecture, and acceptance DOES NOT place any limitations on what you can do with your building, unless the building is located within a locally designated historic district or a design review district. Having a building on the NR is primarily an honor, and it places building owners at a greater advantage to be eligible for financial assistance at the State and Federal levels. What does an average job cost? Is HVP more expensive than a builder? Sometimes, yes. Projects and their prices vary tremendously. Hudson Valley Preservation’s remodeling expertise is extensive- from stonewalls to single room additions to whole house, historic renovations. The design portion of a project can cost between 10 and 15% of the total project. HVP uses a proprietary 3D modeling system that re-creates the exact project specifications online. As a result, we can build a virtual addition to exact spec, ensuring real pricing up front, allowing you to get actively involved in your dream design – secure in its functionality and within your investment program. No surprises. Is design and build for everyone? Hudson Valley Preservation understands that translating a client’s dream into reality takes the right fit on many levels: personality; style; and the investment necessary to do the job well. We can’t be everything for everybody and the first step in our design and build process is to discover if we’re the right fit for you. Hudson Valley works with people who want to be actively involved in their remodeling project but realize they don’t have the time. We look to partner with the client to find a design solution that works for them. We research all projects- things are never as simple as they look. This takes time. If you want the lowest price you may prefer the design/ bid/ build method – and all that that implies. HVP clients choose us because they’ve placed a priority on a guaranteed price and delivery schedule, and the ability to resolve issues before they become problems. Hudson Valley delivers peace of mind. What can HVP offer if I want to build a new addition to my old home? It is only realistic that buildings need to change over time to accommodate modern living and growing families – this has been the case for centuries. 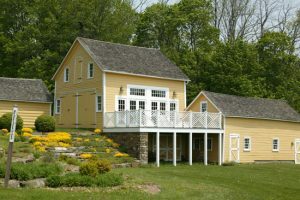 With our knowledge of architectural styles and strategic ways of incorporating new with old, we can help you design an addition that will not detract from your existing building, but will complement it while still maintaining its own unique quality. Rather than simply attaching a separate entity, we work methodically with buildings to understand them and develop a solution that is both beautiful and harmonious. Can you guarantee a fixed price? Absolutely. Our research in the design phase removes most of the variables associated with remodeling. Our trade contractors have all seen the project during the design phase so they know what to expect during the construction phase. The 3D rendering of the proposed work and 24-hour online access gives the homeowner a clear picture and input on what she’s getting before the work begins. Materials and appliance or fixture shopping with an HVP member who maintains a clear budget with the client minimizes the possibility for any add-on costs. Once the project is signed at the beginning of the construction process, we give you a fixed price. If we are asked to do more than the terms of the contract, we’ll have to charge more and it will take longer. The reciprocal is that if the client chooses to cut back on the project, we cut back on price and duration. Any changes that might affect cost or timing are fully understood and approved before they are executed. Hudson Valley has a master carpenter on-site daily to stay on top of any issues as they might emerge. We’ll start your job, when we know we can finish it -on time and to your satisfaction. Working with HVP is unlike any other building experience you may have had. In order to guarantee pricing, get the necessary permitting, build the house of your dreams and do it on time, we execute serious planning up front. We take all variables into account- (including that special order tile your heart was set on). We build your project on paper before we start in your home. We try to get as many questions answered before the project begins. Each project requires your approval -a signed contract, completed designs to your specs, materials and permits in hand. Last but not least, we will not start unless we have honorably fulfilled prior commitments. Adherence to this last rule positions us extremely well for generating very high levels of satisfaction.